Last month we mentioned that Disney were looking to introduce a VR element to Disney Springs. that included Star Wars. We have exciting news today for Star Wars fans! Tickets are now available for a new hyper-reality experience, Star Wars: Secrets of the Empire by ILMxLAB and The VOID, an offering that will debut at Disney Springs at the Walt Disney World Resort December 16 2017. The experience lasts 30 mins and costs $29.95 per person. Tickets can be purchased from the Void. Who’d like to do this? It’s like Disney have finally turned on the Star Wars tap, following on from all the great information released by Disney at D23 including Star Wars: Galaxy Edge and the proposed hotel experience Disney have today confirmed that they’ll be opening a hyper-reality experience at Disney Springs. Star Wars: Secrets of the Empire will plunge guests directly into the iconic Star Wars galaxy. Visitors will move freely throughout the untethered, social and multi-sensory experience in a way that allows them to interact and engage with friends, family and Star Wars characters. This ground-breaking experience will open to the public at a new VOID Experience Centre at Disney Springs at Walt Disney World Resort beginning this holiday season. This first-of-its kind Star Wars experience is being produced by the world-class teams at Lucasfilm and ILMxLAB in collaboration with the team at The VOID. Soon you’ll have the opportunity to step beyond reality into a galaxy far, far away! At The VOID, we combine the magic of illusion, advanced technology and virtual reality to create fully immersive social experiences that take guests to new worlds. A truly transformative experience is so much more than what you see with your eyes; it’s what you hear, feel, touch, and even smell. Through the power of The VOID, guests who step into Star Wars: Secrets of the Empire won’t just see this world, they’ll know that they are part of this amazing story. At ILMxLAB, we want people to step inside the worlds of our stories. Through our collaboration with The VOID, we can make this happen as guests become active participants in an unfolding Star Wars adventure. By combining Lucasfilm’s storytelling expertise with cutting-edge imagery, and immersive sound from the team at Skywalker Sound, while invoking all the senses, we hope to truly transport all those who experience Star Wars: Secrets of the Empire to a galaxy far, far away. “Star Wars: Secrets of the Empire marks an important milestone in the continued expansion of The VOID, which also joined the 2017 Disney Accelerator earlier this year. Through the power of The VOID, guests can now experience the magic of Star Wars first-hand. When we hear more about details and an opening date we’ll let you know. 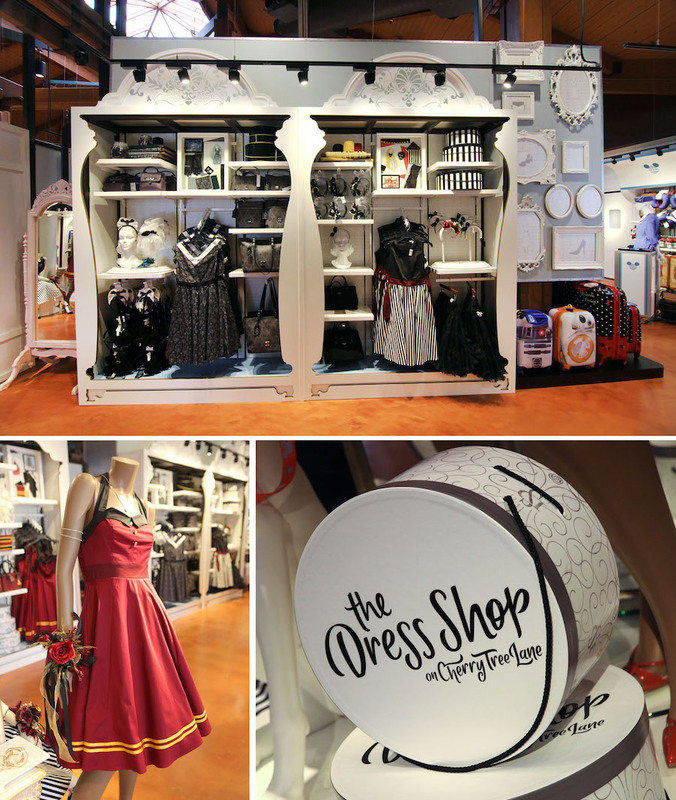 The Dress Shop is a well known apparel and accessory collection which is created especially for Disney Parks. 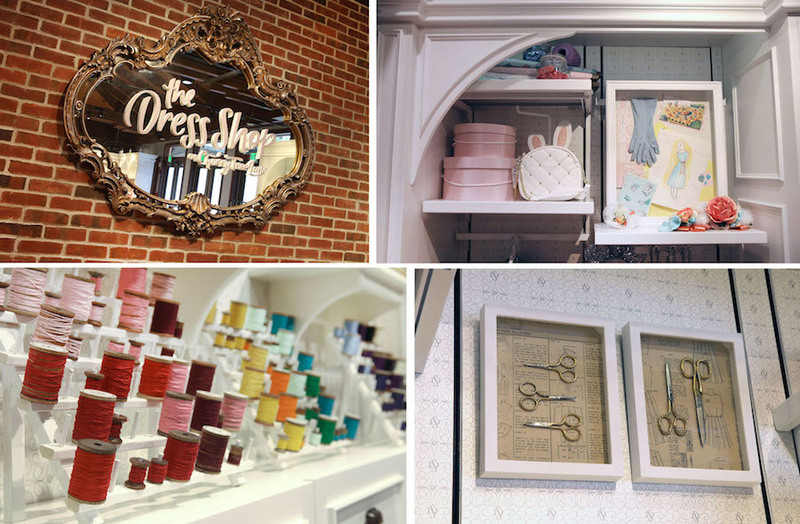 On July 27th The Dress Shop is returning to Cherry Tree Lane in the Marketplace Co-Op at Disney springs. It was first introduced in the spring and is filled with loads of nostalgia that Disney fans love. David Soliman, area manager for merchandise presentation at Disney Springs, describes how they created the shop-within-a-shop at the popular accessories boutique. A quote from Disney’s blog explains how Mariana Martinez who is a graphic designer partnered with the team to develop a “Dress Shop” monogram that is incorporated throughout the area. Once The Dress Shop returns, guests will be able to see ten original dresses which were inspired by Walt Disney’s Enchanted Tiki Room, the Orange Bird and the Haunted Mansion. They are also going to be introducing a Cinderella inspired dress which is going to contain metallic embroidery. – Now that is something I would buy!! I can’t wait to visit this shop, so many pretty dresses to look at! Its been on the cards for a while now but we’ve finally had confirmation that Disney’s five story video and virtual games centre will close on July 3rd. Home to CyberSpace Mountain, Pirates of the Caribbean: Battle for Buccaneer Gold, design your own roller coaster simulator ride and the Mighty Ducks Pinball Slam (a life-size game in which players stand on a joystick that controls cartoon characters on a screen.) DisneyQuest opened in 1998 and was a much loved feature. Taking its place will be The NBA Experience, which will include high-tech experiences, a restaurant and a store and will probably prove a great addition due to the popularity of Basketball. We’ll let you know once we get more details. Disney Springs Is Getting A Makeover! Disney Springs, formerly known as Downtown Disney is going to be having a few updates. Some you will notice almost straight away like with The Characters in Flight Balloon. With a complete colour change and character removal, it’s almost unrecognisable. Disney Springs is aiming for a more general look rather than focusing primarily on Disney which will be shown more with some of their new projects. D – Living only opened last month but it’s due for a refurb! Not to worry, it’s only going to be closed from January 31st through to February 2nd so hopefully you won’t miss out on too much home shopping. Planet Hollywood is rumoured to be opening again next week and we cannot wait! It’s definitely been a long time coming, right?! I’d imagine this will bring a lot more visitors to Disney Springs as I’m pretty sure it’s one of people’s favourite restaurants in Orlando! Fulton’s Crab House has been changed into the new Paddlefish which was due to open last year however some rumours have been floating around saying that it looks like the construction is beginning to wrap up. Hopefully it won’t be long now until we get to see the finished project! For those of you who have been to Disney Springs before will know they have their own hat shop, Chapel Hats. They are now going to open up their own sock and underwear shop! Are you a Disney Springs fan? If so, what’s your favourite part? Disney are opening a new show at Disney Springs, Starbright Holidays – An Intel Collaboration. The show is a one-of-a-kind drone-based technology show, never before used in the United States! Although there is no actual ‘story’ behind the show, the fact there is 300 show drones, you will no doubt be left in awe. We’re hoping Disney might eventually bring this technology into their parks and amaze us even more (if that’s even possible). The shooting star drone can fly for up to 20 minutes and features built-in LED lights that can create over 4 billion colour combinations in the sky. All 300 drones in the sky throughout the show are controlled by one computer and one pilot drone. It’s amazing what you can do with some technology these days! If you’re lucky enough to view Starbright Holidays this festive season, try and watch it from the West Side as this is where you will get the best view! Visitors to Disney Springs can now see two new acts at Cirque du Soleil’s “La Nouba” show. The popular attraction has added a breakdance crew and an aerial bamboo act adding even more thrills to its already electrifying show. Lets take a little look at what we can expect! The new crew is made up of Josh Ortiz AKA “Incredible Josh”, Jean Carlos Lloret AKA “Bebo” and Dmytro Li AKA “Flying Buddha”. These guys are the pinnacle of B-Boying with more head spins than Cobra’s Curse they are sure to be a massive hit with audiences. I’ll hold my hands up, I had no idea what this was… however the act features Russian couple Alexander and Ekaterina Abramov, who perform amazing feats of dexterity on a bamboo like pole hanging from the ceiling. Its one of those acts you watch through your fingers and gasp every 10 seconds when you think they might fall. The new acts are bound to breath new life into an attraction that for the majority of its time has stuck to its tried and tested method. I can wait to see them both. You can purchase tickets for Cirque Du Soleil direct from Orlando Attraction Tickets.